The cottony cushion scale was described by Maskell (1878) from specimens sent to him by Dr. Purchas from Auckland, New Zealand. The host was kangaroo acacia and the insect was named for Dr. Purchas. At that time only one other species was known in the genus Icerya (Maskell 1878). This scale is apparently native to Australia and made its way to California on acacia plants around 1868 or 1869 and in about ten years was causing damage to citrus groves in southern California (Ebeling 1959). 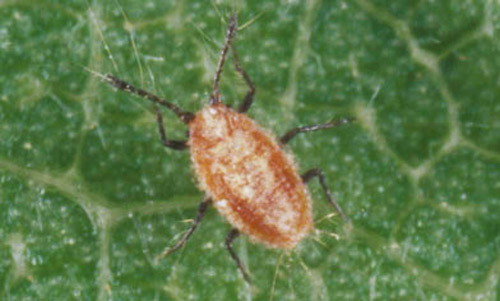 New control methods used first in California and later the rest of United States led to the implementation of biological control and legislative quarantine (Ebeling 1959). Figure 1. Several life stages of the cottony cushion scales, Icerya purchasi Maskell, on a twig. Photograph by Paul M. Choate, University of Florida. The cottony cushion scale is now widespread throughout the world wherever citrus is grown (Ebeling 1959). In Florida, this scale has been reported from most counties. The following account of the introduction of this scale insect into Florida is largely taken from Gossard (1901). The vedalia beetle, Rodolia cardinalis (Mulsant), was introduced into California in 1888 for the biological control of the cottony cushion scale (DeBach 1973). In 1893, the owners of a nursery in Keene, Florida (Pinellas County) sent an inquiry to someone in California about the possibility of the vedalia beetle (a ladybug) being used to control other scale insects in Florida. Apparently interpreting this as a request for the ladybug, the California party sent a shipment of these ladybugs and included some cottony cushion scales as food for the ladybugs. The nursery owners, who either did not see the scales or assumed they would be of no consequence, left the packing container near a citrus tree which eventually became infested. The originally infested Florida trees were destroyed, but infested trees appeared again in late 1898. However, this was presumably from a new introduction from nursery stock in about 1895 (Gossard 1901). Figure 2. Adult vedalia beetles, Rodolia cardinalis (Mulsant), feeding on cottony cushion scale, Icerya purchasi Maskell. Photograph by Division of Plant Industry. 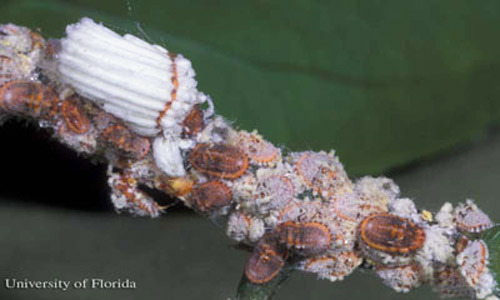 The cottony cushion scale can be distinguished easily from other scale insects in Florida. It is the only species of Icerya present in Florida. The mature females (actually hermaphrodites) have bright orange-red, yellow, or brown bodies (Ebeling 1959). The body is partially or entirely covered with yellowish or white wax. The most conspicuous feature is the large fluted egg sac, which will frequently be two to 2.5 times longer than the body. The egg sac contains about 1000 red eggs (Gossard 1901). Figure 3. Adult female cottony cushion scale, Icerya purchasi Maskell. Photograph by Division of Plant Industry. Depending on the temperature, eggs hatch in a few days to two months. 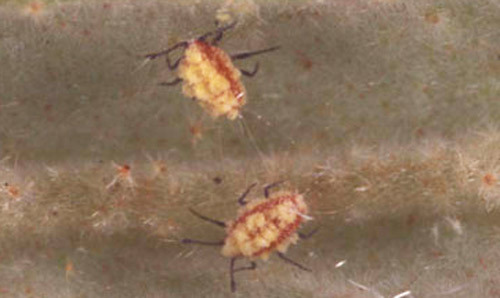 The newly hatched nymphs are bright red with dark antennae and thin brown legs. The antennae are six-segmented. This is the primary dispersal stage. Nymphs can be wind-blown to new locations, crawl to nearby plants, or possibly hitchhike on other animals. After three molts the adult begins to deposit eggs and secrete the conspicuous egg sac. As the egg sac is formed the scale’s abdomen becomes more and more tilted until the scale appears to be standing on its head. Figure 4. 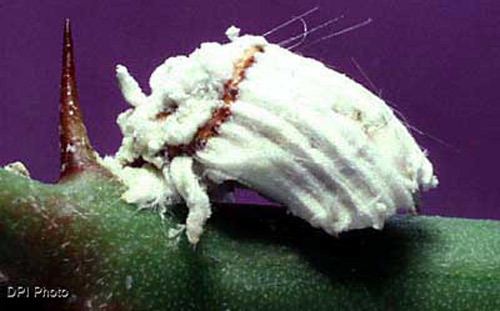 First instar crawler of the cottony cushion scale, Icerya purchasi Maskell. Photograph by Lyle J. Buss, University of Florida. Figure 5. Early nymphal stage of the cottony cushion scale, Icerya purchasi Maskell. Photograph by Lyle J. Buss, University of Florida. Figure 6. Various nymphal stages of the cottony cushion scale, Icerya purchasi Maskell. Photograph by Lyle J. Buss, University of Florida. Males are rare. They are winged with a dark red body and dark colored antennae. Dark whorls of setae extend from each antennal segment, except the first (Ebeling 1959). It is interesting that the female is always a hermaphrodite with both testes and ovaries. If self-fertilization occurs only hermaphrodites are produced; however, when a hermaphrodite mates with a male, more males and hermaphrodites are produced (Ebeling 1959). Cottony cushion scale is most frequently collected on Citrus and Pittosporum in Florida. However, numerous records on other host plants are in the Division of Plant Industry insect files. The cottony cushion scale can severely damage trees, resets, and nursery stock. Decreased tree vitality, fruit drop, and defoliation result from the feeding of this scale. Most damage occurs from the feeding of the early immature stages of the scale on the leaves, where they settle in rows along the midrib and veins, and on the smaller twigs. The older nymphs continue to feed, but migrate to the larger twigs, and finally, as adults, they settle on the larger branches and trunk. This scale is seldom found on the fruit. Added damage can result from the accumulation of sooty mold due to the honeydew excreted by the scale. Debach P. 1973. 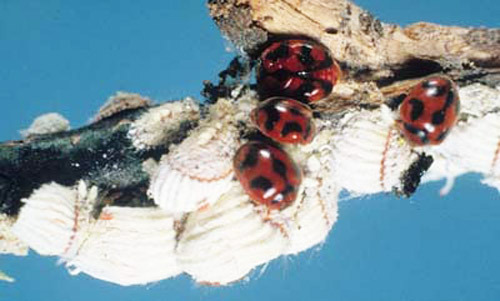 Biological Control of Insect Pests and Weeds, Chapman and Hall, London. 844 p.
Ebeling W. 1959. Subtropical Fruit Pests. University of California Press, Los Angeles. 436 p.
Gossard HA. 1901. The cottony cushion scale. Florida Agricultural Experiment Station Bulletin 56:309-356. Maskell WM. 1878. On some Coccidae in New Zealand. Transactions and Proceedings of the New Zealand Institute 11: 220-223. Morrison H. 1928. A classification of the higher groups and genera of the coccid family Margarodidae. USDA Technical Bulletin 52: 203-211. Originally published as DPI Entomology Circular 352. Updated for this publication. Publication Date: July 1998. Latest revision: April 2017. Reviewed: May 2014.